SO WHAT'S IN YOUR HANDBAG? If you work in the fashion or the creative industry, you probably rely on a few essentials to get you through a full day of shoots or back-to-back events, shows, and parties. A few handbag must-haves is all you need to prepare for inescapable long days and late nights. 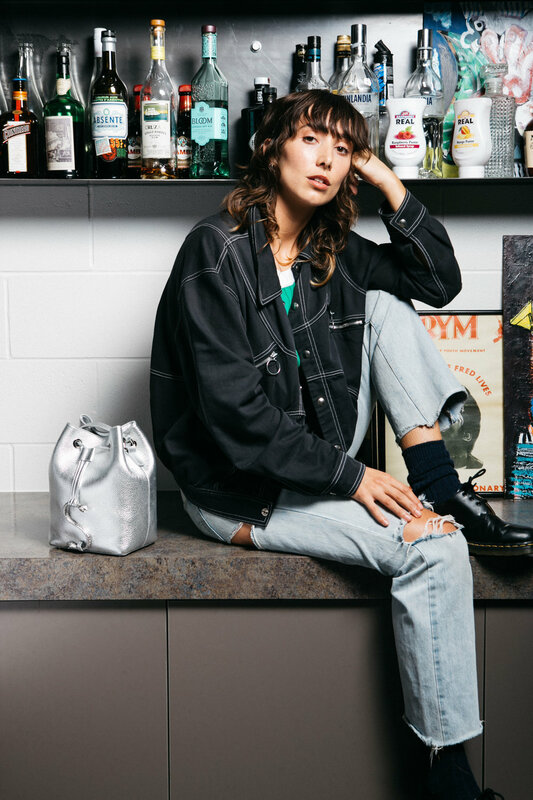 Here, five industry creatives share what they always carry in their Stolen Girlfriends Club bags along with deets on their favourite places to let their hair down and have a great night. 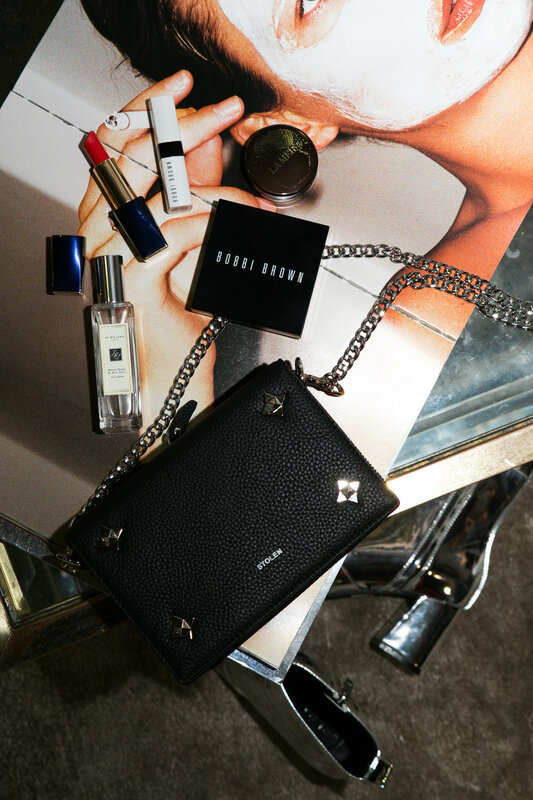 Dream girl and model Becca Haeger is as captivating as she is cool and effortless – but what does she carry in her handbag? I have just graduated from university after studying Graphic design; so have been doing freelance design work to build up my portfolio as well as working retail at Black Box Boutique! I’m really interested in print design, and have started a project with photographer Adam Bryce that will be coming out soon. I’ve had the opportunity to help with the creative direction, which is something I’ve really enjoyed doing and hope to continue doing in the future. A good night out for me would probably have to be a BYO with all my friends. My favourite place is Bona Pizzeria at Three Lamps in Ponsonby. They have $5 beer and wine every night, no byo charge and have heaps of vegan options which not very many Italian places do. So yum and a minute walk from my flat, which is a bonus. Usually I’m too full to go anywhere else afterwards, apart from the gelato shop next door. I don’t carry much in my bag! I’m always losing things and hate rummaging through a bunch of stuff so just take the things I need for the day. I’ll always carry lip balm with me; it fits perfectly in my wallet so I never forget it. My friend Steph Viterbo actually made my violet fluffy wallet for my birthday and I looove it. I got the Ashley & Co. lip punch on an Air NZ flight and have continued buying it ever since, it’s made with essential oils and doesn’t have a strong smell, which I really like. I don’t usually wear much make up, so a mascara [YSL] is perfect to have with me in case I need to chuck it on when I have plans after work. I take my phone, keys and Mars Official sunnies everywhere, and depending on my day I’ll occasionally take a book I’m reading for when I’m at shoots or in between jobs. Follow Becca's work here on instagram. So what does one of the most in-demand models carry inside her bag when she steps out? Model and Bravo NZ Host Cassidy Morris is always on the go. Cassidy's work allows her to interview celebrities (on the show "The Dish") and update us on all things fashion and beauty. Exciting! My ideal night out is some yummy dinner (somewhere really nice). Followed with some drinks, and I would LOVE if there was a live band playing! I alway have a lip balm with me, that is my ultimate (I don't think I had one in my shoot but I usually alway have it with me) also a pen, definitely a Tom Ford perfume my iphone! those are my top items. Follow Cassidy's work here on instagram. Leave it to the beauty pros to carry only a few but the best beauty essentials for a big night out. Covetable hairstylist and (the queen of effortless cool hair!) Chloe Zara also shares her pro tip below along with her favourite places to dine in Auckland. Dinner and a few wines... Or a long lunch!! I love Amano, Prego and always SPQR!!! I always take a mini size perfume, lipstick & eyeliner… and of course sunnies for the day time. I love to carry a mini size hair oil [EVO Shine Drops] to keep my hair smooth and shiny, especially on rainy days, always helps with the humidity! Also quiet often a portable phone charger too. Follow Chloe's dreamy work and inspiration here on instagram. Ex-model, artist and house painter (and the coolest girl around) India Murane shows us the items she can’t live without, from her Olympus film camera, ear plugs to her favourite products. I work as a house painter during the week, which suits me surprisingly well, as I get to be outside and listen to podcasts all day. I’m constantly consuming stories in one form or another, be they podcasts, movies, songs or books. I guess that is my lifelong interest. I also take photos, play music, surf and draw/tattoo. An ideal night would be swimming on dark at Point Chev beach, dinner at Achos (St Kevin’s arcade), watching my friends play at Whammy (St Kevin’s arcade), then heading down to Charlie’s (K Road) to sing karaoke and drink cheap beer. I don’t normally carry a lot. I only take a small bag so I can move around and dance but I will always have my wallet, an old Olympus 35mm point and shoot, ear plugs for loud gigs and Tui Balm. If I do take makeup, I take products with multiple uses like the NYX hot red eye shadow, which I use on my lips, cheeks and eyelids and a jumbo eye pencil which I use on my waterline and also smudged over my whole lid when I’m feeling brave. Tui Balm is the best all round balm ever. It isn’t sticky, you can use it on your eyelids for a wet look and the smell is super calming. You can follow India here on instagram. 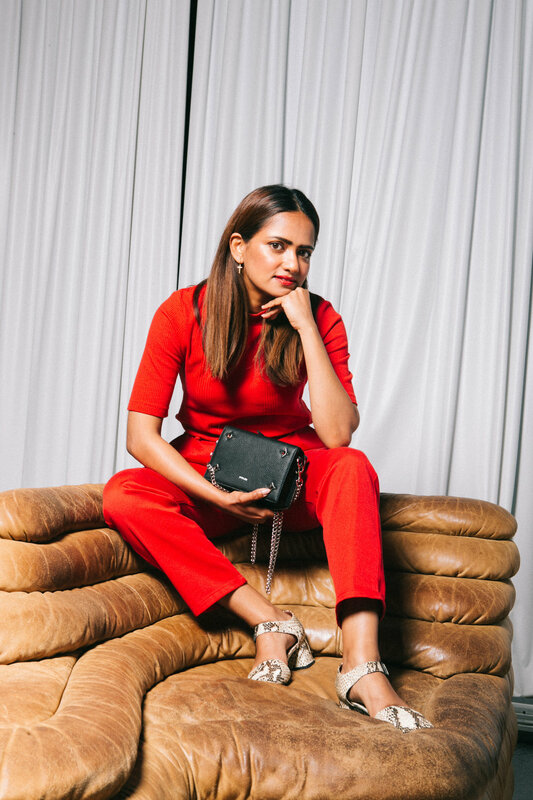 Zeenat Wilkinson is the founder and editorial director of SAUCE, and talks about what's in her bag – from way to many lipsticks and lip balms to iphone and perfumes. The best beauty essentials and products that help with an all-day-glow! A really good night out is actually a night in with my friends! But I do love going to Coco's Cantina with my gfs. It's become some sort of a ritual (hello happy hour prosecco!) Also Annabel's Wine Bar. They do a really good cheese board. Yum cheese! Jo Malone London Wood Sage & Sea Salt - I love the impact a good fragrance can create when you meet someone. Jo Malone London (50ml) stays very close to the skin but always makes me feel somewhat "fancy". Bobbi Brown Extra Glow Lip Tint in Melon, La Mer Lip Balm & Estée Lauder Pure Colour Envy Lipstick - Always on high rotation! I don't do bare lips, it makes me feel washed out and dull so I always wear a little colour and carry lip balm. You can follow her work here and her personal gram here. In collaboration with Stolen Girlfriends Club. View the new handbag collection here.